Here are more news articles about GSDs in the News 2 that have recently been in the news, for one reason or another. Enjoy reading. (CBS) You weren't seeing things if you thought you saw a German Shepherd in the audience during President Bush's State of the Union address Tuesday night. Rex, a 5-year-old German shepherd who served as a military bomb-sniffing dog, was "seated" near first lady Laura Bush, as was his handler, Air Force Tech. Sgt. Jamie Dana. Dana and Rex trained together for three years before deploying as a team to Pakistan and then to Iraq, according to the White House. On June 25, 2005, they were riding in a Humvee in Kirkuk, Iraq, when a roadside bomb exploded, injuring Dana. "The last thing I remember," she told The Early Show co-anchor Julie Chen Wednesday, "I was laying on a table in the field hospital." Her first thoughts were of Rex: "That's all I remember asking, 'Where's Rex? Where's Rex?' He wasn't there. I didn't really know what happened." At first, Dana was given erroneous word about his fate. "I think one of the medics, they were told he was dead," she told Chen. "That's what they told me. With all the confusion, I have no doubt it was a little confusing." Later, as Dana recovered in Walter Reed Army Medical Center outside Washington, D.C., she sought to adopt Rex, but ran into obstacles. The Air Force initially said it spent $18,000 training Rex, and by statute he needed to work the remaining five years of his useful life before he could be adopted. But after some prodding by some lawmakers, the military asked Congress to add language to the annual defense bill to allow exceptions to that statute. The language became part of the Defense Appropriations Bill that President Bush signed last month. "Initially, I was told no, which I completely understood because the mission comes first. That's something all military people understand," Dana said. "But, apparently, my friends and family back home took up the cause for me and started writing senators and congressmen and everything. So the ball just went from there. It was kind of out of my hands. It definitely had a happy ending." And that was followed by Tuesday night. "It was a great honor," Dana said. "I mean, President Bush and Laura were both very friendly and, really, I owe them a great deal of thanks for letting Rex be here with me. … It was just an honor most people don't get to experience." "Rex is retired. I'm undergoing my medical boards," she said. "We'll see how that turns out. My dream is to go to veterinary school." Retired MWD, military working dog, Benny is now an ambassador for other military working dogs waiting to be adopted. Now a therapy dog, he works with aging veterans, the elderly and head trauma patients. He also recently won an American Kennel Club award for being "outstanding," has been profiled on television and in print, and will soon be featured in the December issue of Dog Fancy. "Not bad for a dog who was sentenced to die," Mrs. Kandoll, his new owner said. Want to read even more about Benny story and Benny and Debbie Kandoll's new effort to adopt other military working dogs to families? Inquirer Staff Writer Just which little puppy will win the title of First Dog in the White House is still a mystery, but the race for Second Dog is all wrapped up. Dog lovers the world over will have to wait until next year for President-elect Barack Obama and his family to pick their new puppy, but Vice President-elect Joseph R. Biden Jr. has added a little black and brown ball of fur from Chester County to his family. Biden, along with his grandson and a seven-car convoy, pulled up to Linda Brown's kennel in Spring City on Saturday to choose a new companion to join him at the vice presidential mansion in Washington. Biden selected a striking, six-week-old German shepherd who yesterday was lying on a carpet, snuggling with a stuffed animal and his litter mates. 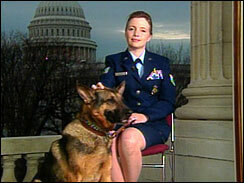 A spokeswoman for Biden said he chose a German Shepherd because he has had three others and is familiar with the breed. "He has been looking forward to getting a dog for a long time," said spokeswoman Elizabeth Alexander. "He has promised grandchildren they can name it." Brown, 63, who advertises as JoLindy's German Shepherds, has been a breeder for 40 years. She was referred to the Bidens by Delaware police-dog trainer Mark Tobin, who will have the task of house training the new pup. "These are family dogs with longevity," said Brown, who imports stud dogs from Germany. Brown, who holds a state commercial kennel license under the name Wolf Den, would not divulge the prices of the puppies. State records show Brown has the largest class size kennel, which allows her to keep more than 250 dogs a year. In July, dog wardens recorded 84 dogs on the property and 192 dogs sold or transferred in 2007. Many of her adult dogs live inside her ranch house, said Brown, as she showed a reporter around her property, which includes two indoor dog pools. Several dozen dogs live in outside pens surrounding the house with access to utility sheds or dog houses. Meanwhile, pro-adoption advocates, who appear to have prevailed in an argument with breeders over whether Obama should purchase or adopt a dog, are angry that Biden would choose to buy one. "We are surprised that Sen. Biden chose to purchase a dog from a commercial kennel since he has been a leader on animal-protection issues and has championed a number of important animal-welfare reforms in the Senate," said Michael Markarian, executive vice president of the Humane Society of the United States. "President-elect Obama can send a stronger message of hope and change for animals by adopting a homeless dog from an animal shelter or rescue group." Biden's spokeswoman defended his commitment to animal issues - saying he has gone so far as to personally help animals in need. "Vice President-elect Biden has a stellar animal-rights record, and was one of only seven senators who in 2008 received a 100 percent rating from the Humane Society, which also called him a 'Humane Champion' and a 'prime-sponsor of pro-animal-rights legislation,' " Alexander said. She added: "He is an advocate for rescuing animals, as shown by his rescue of the Biden's current cat, Daisy, from a local shelter." Dogs are playing an ever growing role in the US military's effort in the country of Iraq Vendi, a 4-year-old German Shepherd recently returned home to Fort Belvoir, Virginia, from a tour of duty in Iraq. For the last six months, she has had the responsibility of detecting explosives and sniffing out landmines, saving lot's of lives in the process. She is one of the many unsung heroes, military working dogs who work alongside U.S. service members, endangering their lives to try and make the world a better place. Their are roughly 500 MWDs currently detailed to the Army, most of which are working with Soldiers in Iraq, said Sgt. 1st Class Donald Nelson, Fort Belvoir's K-9 kennel master. Deployed dogs can spend up to a year in the war zone before returning home to resume duties as patrol dogs, specializing in narcotics or explosives detection. Nelson currently has a team of 10 dogs and 10 handlers that make up the Fort Belvoir Police Canine Unit, and he anticipates getting four more dogs in the near future. "These dogs are our partners, not our pets," Nelson said. Most of the time, the dog becomes its handler's best friend, and a foe's worst enemy. When their aggression level is high, they can become very dangerous. They become "war dogs," and they can be as intimidating and formidable as any armed Soldier, at times, more so. According to Nelson, the average German shepherd's bite can exert up to 1,200 pounds of pressure per square inch. Seven-year-old Arrow, a German shepherd and Belgian malinois mix, has an impressive record under Nelson. Arrow assisted the U.S. Secret Service in about 50 missions, including providing security at the 2004 Democratic and Republican national conventions. Arrow and Nelson also helped provide security for President Bush and John Kerry on the 2004 campaign trail. Fort Belvoir's team of German shepherds and Belgian malinois are dual-certified as either patrol-narcotics or patrol-explosives dogs. Each are able to precisely locate a large variety of explosives or narcotics. Using a series of simple, on-word commands, the dog and its handler are extremely focused and obsessive while searching for contraband. All dog teams are held to high standards and are subject to monthly proficiency tests and quarterly validations, Nelson said. He added that German Shepherds and Belgian malinois are specifically chosen for this line of work because of their endurance, speed, strength, courage, intelligence and adaptability to almost any climate. They are valuable companions in dangerous situations because their senses of smell and hearing are considerably more powerful than a human's abilities. "The dogs smell the way we humans see. They can smell an infinite number of different scents in an area, just as we see many different images at once, in one place," Nelson said. Two-year-old Tarak is the newest German shepherd at the Belvoir kennel. Tarak arrived in March from Lackland Air Force Base, Texas, where all MWDs receive initial training. Tarak graduated from a grueling 120-day training course that teaches MWDs a variety of aggression techniques, including methods of attack. The first phase of training involves searching buildings to seek out human enemies. The second phase involves detection training. The primary duty of a patrol dog team is to utilize the animal's keen sense of smell and hearing to conduct walking patrols around buildings and in open or wooded areas, "for people who try to elude police," said Nelson. These highly intelligent dogs are trained to remain alert but calm in the presence of unfamiliar people, and to discriminate between threatening and nonthreatening persons. The dogs are also trained to attack on command and to halt their attack just as quickly when commanded. Nelson said the Army has an extremely strict policy concerning the training of these dogs. Each team undergoes at least 16 hours of monthly training, in both detection and patrolling. For narcotics dogs, they must maintain a 90 per cent proficiency rate; and in explosives detection, the dogs must maintain a proficiency rate of 95 per cent. Once the dogs receive their initial training, they begin work as a team. The dog and handler have skills to learn. Most importantly, the handler has to learn to recognize what the dog is trying to communicate, Nelson said. Each handler is responsible for one dog and must build a solid rapport with their canine companion. The hope is that by making handlers responsible for the dog all the time, for feeding, grooming and exercising, the results will be an effective and trusting team. Army regulations dictate that handlers and their MWDs have 45 to 90 days to become certified as a team in either narcotics or explosives detection once the team is given their assignment. While training and maintaining their dogs, handlers must be patient or the dog will become confused and less effective. When a dog performs a desired task effectively, the reward is verbal or physical praise and positive reinforcement. Likewise, with incorrect responses, both praise and reward are withheld. Positive training is the key to effective dog management, Nelson believes.